Weathercraft® has retailers all about the US, but we’re always looking for new retailer possibilities regardless of location. Retailers interested in becoming a stocking authorized Weathercraft® retailer can call our main office at (336) 629-3939 or 1(888) 682-9224 Monday thru Friday, 8am-5pm to learn more about us and what we have to offer you and your retail customers. Interior Designers, Decorators, and Landscape Businesses are also welcome and we encourage you to contact us to see how we can build a business partnership. 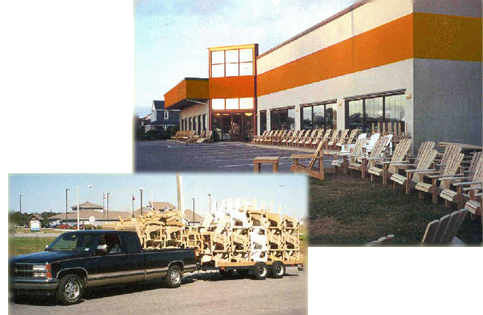 Catalog CDs are available upon request “free of charge” to licensed retail stores interested in our line of outdoor furniture products. We sometimes deliver in our own trucks up to 200 miles from our Asheboro, NC manufacturing plant, direct to your retail store (minimum quantity order required – “Unfinished Only”). Otherwise, we ship FOB direct to your retail store via motor freight. We have several freight companies that give us exceptional freight rates (typically 10-13%). All shipments FOB Asheboro, NC mfg. plant. We can also “direct ship” straight to your customer … residential ground or business deliveries. Our retailers are of course always welcome to pick-up direct at our loading docks.